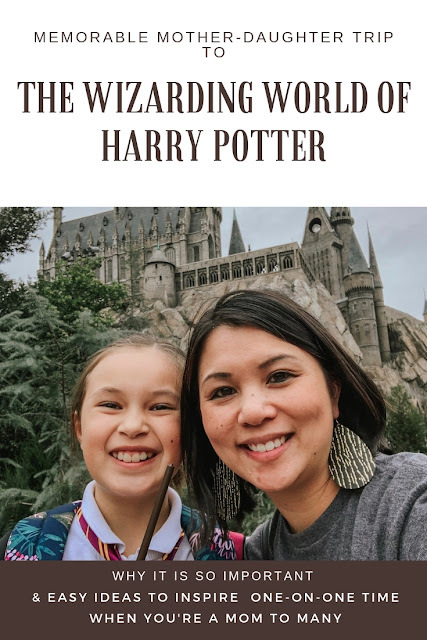 I had so much I wanted to share after our mother-daughter trip to Harry Potter World that I had to split it into two posts! 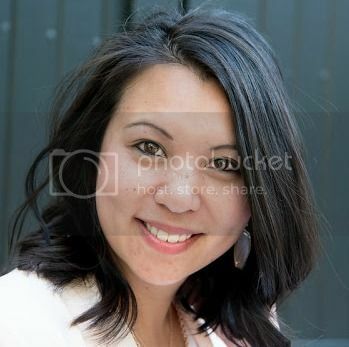 In case you missed it, you can read the first post here, where I share my thoughts on spending one-on-one time and ideas to help inspire you. I also wanted to share some helpful tips I learned after visiting the park. It's my third time to Harry Potter World and I was able to do the most during this trip. Since it was just me and Ava on the trip, we could easily cover more of the park and stay there all day. Look for the telephone booth in "London" and call the Ministry of Magic! If you're planning a trip soon, this post is definitely worth a read! First thing you need to know, the marketing geniuses split Harry Potter World in two parks. 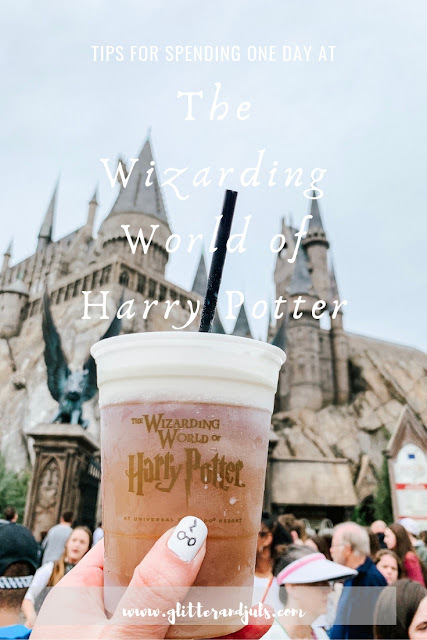 To fully experience The Wizarding World of Harry Potter, you'll need to purchase the park-to-park pass. I definitely think it is worth it and you can totally do it in one day. To ensure you do, I'm spilling my secrets! So let's get to it! 1) Download the Universal Orlando Resort App on your phone. The app comes in really handy when checking wait times for rides, when you need to quickly look at a map and also to reserve a ride time using Virtual Line. 2) I found it extremely helpful to have an initial game plan. What do you want to do first? What rides do you want to ride the most? We came up with our list and mapped it out so we knew what direction to head once we got into the park. We used the map to familiarize ourselves on where things were and it was extremely helpful! Of course, you won't be able to stick to your game plan all day, but having a plan for arrival will save you confusion and precious time. Ava outside 12 Grimwald Place. Take a peek in the window and lookout for Kreacher! Stop and chat with the bus driver of the Knight Bus. The hanging head also talks! 3) I cannot emphasize this enough- wear comfortable shoes! You will spend most of the day walking and standing so don't try to look too cute with your brand new sneakers. Wear your tried and trues for sure! We spent 12 hours in the park and I was so grateful for my broken in Toms. They were comfortable and I didn't have one single blister to slow me down! 4) If you're wondering what park to go to first, I say head to Diagon Alley (located at Universal Studios) first. It's the least crowded during the morning and you can take the best photos! We bought our wand first at Olivander's wand shop and then rode on Gringott's ride. Another quick tip- Olivander's is the official wand shop, but it's not the only place to purchase a wand, in fact, there is a pop-up wand shop just around the corner from Olivander's if you don't care about "The wand chooses you" experience that had no line at all! By purchasing the wand first thing, you can take advantage of all the magical spots to use your interactive wand. 5) Don't get discouraged if Harry Potter World is already crowded. There's lots of stores to explore and you can always come back. We actually left Diagon Alley to head to our other favorite rides like The Simpsons Ride and Men in Black. We walked around the loop making our way through all the rides with the least amount of wait times and ended back at Diagon Alley to hop on Hogwart's Express to the other park. The best time to come back is the golden hour- 7pm. We found there was little to no wait times in all areas of the park! People get tired and leave the park so take advantage of this by coming back to your favorite attractions or ones you missed earlier in the day. Ava just purchased her interactive wand and it comes with a map for all the magical spots to use it! Diagon Alley on our way to Gringotts! You can exchange your money for Gringott's gold to use throughout the park! Inside the train cart. Be sure to ride the train both ways for two different experiences! 6) Ride the Mummy! We came for Harry Potter World, but the Mummy is still my all-time favorite roller coaster at Universal! Ava was scared to at first but she loved it just as much as I did the first time I rode on it! 7) Florida rainy season is no joke. But I find it's all about attitude and preparation. If you know it will rain while you are in the park, pack your rain jackets. The ponchos in the park are over priced and are cheaply made. We didn't get rain on our trip, but I have in the past. The good thing about the rain is that is doesn't tend to last all day. It will come in waves so just have a good attitude about it and explore the shops or stop for a meal/snack until the rain stops. 8) Bring only a small back pack. If you don't have someone watching your belongings while you're on the rides, you'll have to use lockers for some of the rides. The free lockers are pretty small. We packed a back pack and just had a few essentials in it so it easily fit in the lockers. 9) If the wait times are long, take advantage of the single rider lines. I have to admit I was a bit jealous of the express pass people, but tickets for them are steep! But single rider lines cut the wait time in half! Ava is 9 and I was a little nervous at first. But, we agreed we would just wait for each other in the spot right after you get off the ride. And actually, we would end up riding at the same time just in different seats. 10) Ava and I packed some light snacks in our backpack so when we got hungry in lines we had something. 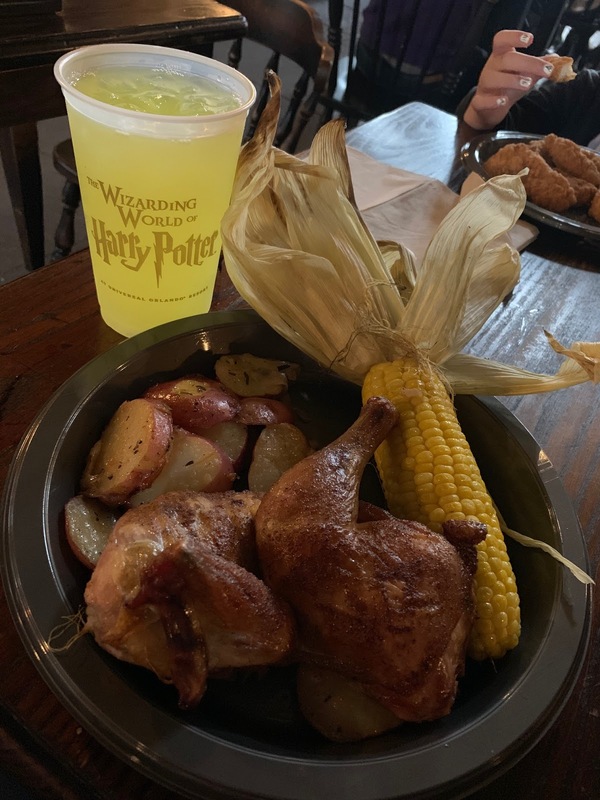 We saved our money for a few fun park treats like churros and butter beer of course! We skipped lunch because wait times go down while people stop to eat, but we made a point to enjoy a nice dinner. 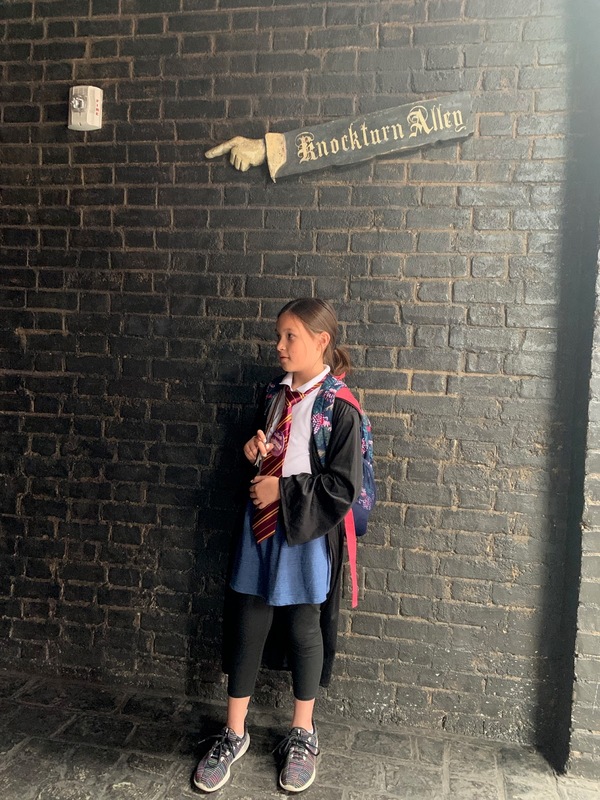 Ava didn't care for the menu at the Leaky Cauldron (British menu) so we had dinner at The Three Broomsticks. She had chicken fingers and I had a nice rotisserie chicken meal. 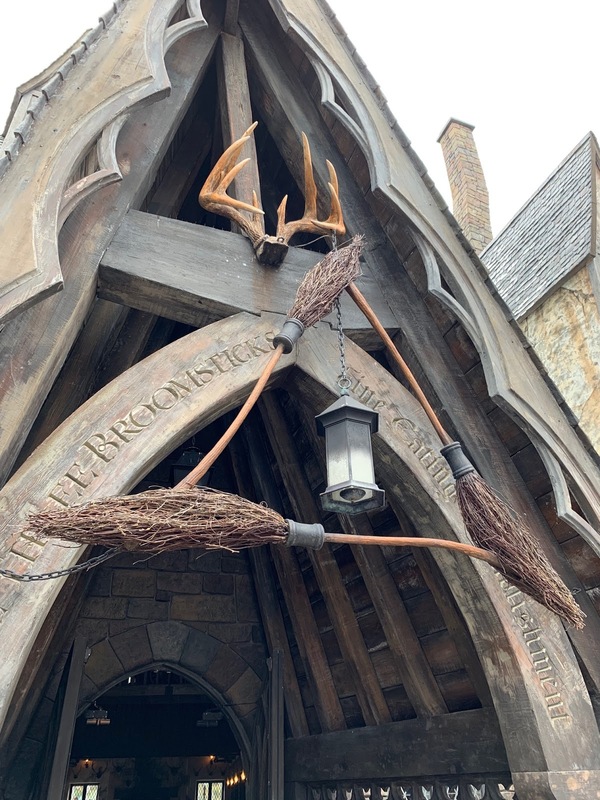 Don't forget this photo op in Hogsmeade next to the butter bear cart! Frozen is my favorite way to drink it! 11) My last tip is check to see if there is a nightly parade. During the parade, lots of people stop to watch. Use this time to go on your favorite attractions/rides! The wait time was 5-15 minutes during the parade so it was perfect! If you're planning a trip soon, then I hope these tips are helpful! We had such a fun time and we rode all the rides and checked off everything on our Harry Potter list! I hope enjoyed reading this post and if you have other tips for us, please leave them in the comments! I know this will not be our last trip to Universal so I'll keep your pointers in mind for our future trips! Ava and I outside Hogwarts! This is another must-have photo op! Bear with me, I'm covering a lot in this post. But I promise, it's worth it. Starting last year, Ava, my eldest daughter (she’s nine), discovered Harry Potter. She started off with the movies and has recently grown interest in reading the books. When she started to fall in love with it I was so excited because I am such a fan of the series. I knew I wanted to take her to Harry Potter World also known as The Wizarding World of Harry Potter at Universal Studios in Orlando. Originally, I planned for the whole family to go, but then I started to think how awesome it would be to spend some one-on-one time with Ava. Ever since Lily (my second oldest) was born, we have always done things with both girls. This was an opportunity to take a mother-daughter trip and spend some quality time with just us. Happy birthday to me! It’s so funny how birthday celebrations change as you get older; at least it has been for me. Not that my birthday isn’t worth celebrating, but I don’t put that much emphasis on the actual celebration as I did in my 20s. I am now perfectly content with simply spending it surrounded by my favorite people. I don’t get many mom outings, a day without the kids, especially on the weekend but I was invited a few weekends ago by my friend Amy Darley for a fun morning out with other influencers at AR Workshop Savannah! 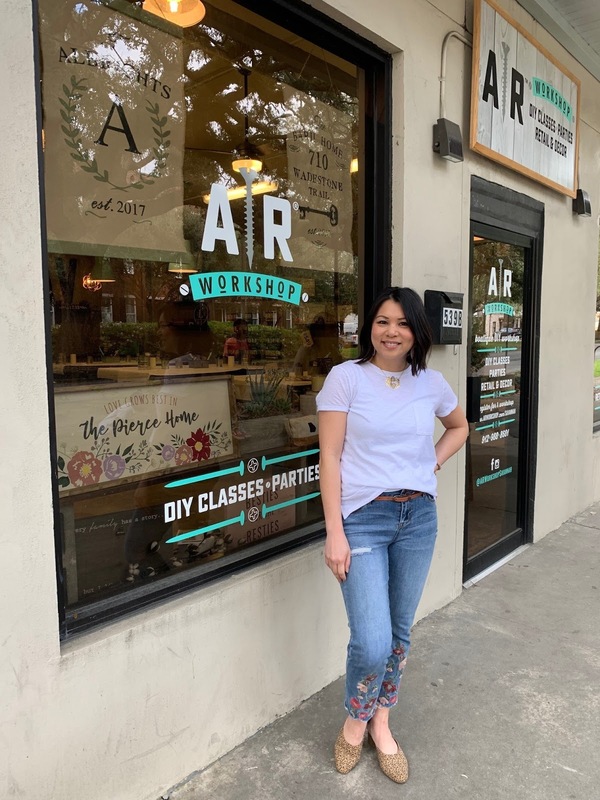 AR Workshop is a new boutique DIY studio in Savannah that offers hands-on classes creating custom home décor. I love a good DIY and was so excited to create a custom piece for our home. I chose to make a wood framed sign to hang in my master bedroom. AR Workshop has so many fun projects though, not just wood signs. A few of the ladies made cheese boards and decorative trays. They offer classes to make chunky knitted blankets and it’s on my wish list of classes I want to sign up for. You don’t need any carpentry skills for these classes. The girls and I had a blast. There was fun music playing while we worked and we drank mimosas. I mean, such a fun way to spend a Saturday morning! And I got to take my hard work home with me in the form of a super charming and rustic wood sign! Check out some of the fun shots I took while we were getting our wood-working on!